Already we are in the middle of February and the new year resolutions are long forgotten? Here at Henry wag January went in the blink of an eye, but mostly because we’ve had rather a lot on our plate. The new 2019 product range was launched at the BETA show (British Equestrian Trade Association), held at the NEC in January, with many Country and farm stores seeing Henry wag for first time and offering positive feedback on the range, endorsement that we are doing things right. Really encouraging was the response to the Equine range, with lots of people from the equine ‘field’ (see what we did there) suggesting new applications for horse products using the drying technology in our towels. This weekend saw the range being paraded for the first time before the pet trade at the PATS exhibition (Pet and Aquatic Trade Show) held at Sandown Park Racecourse. There were no horses, but Henry Wag did secure a winner at the event, being awarded best entry into the new products showcase for Dog Drying Coat in the category of Dog Accessory and Toys. The Judges said, “This is a reasonably priced, good quality product that is easy to wear and easy to get on and off”. This a valuable endorsement from some highly respected industry experts and is proof that engagement with our customers during the product development stage does pay dividends. Thank you. 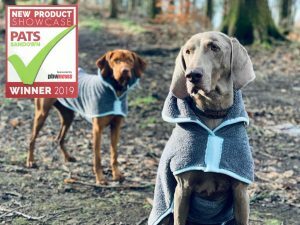 There have already been a flurry of orders for the new range from retailers and much of the range is available through either Trust or Trilanco, so if you are a dog owner of pet shop, you should find it easy to get your paws on the new range from Henry Wag.